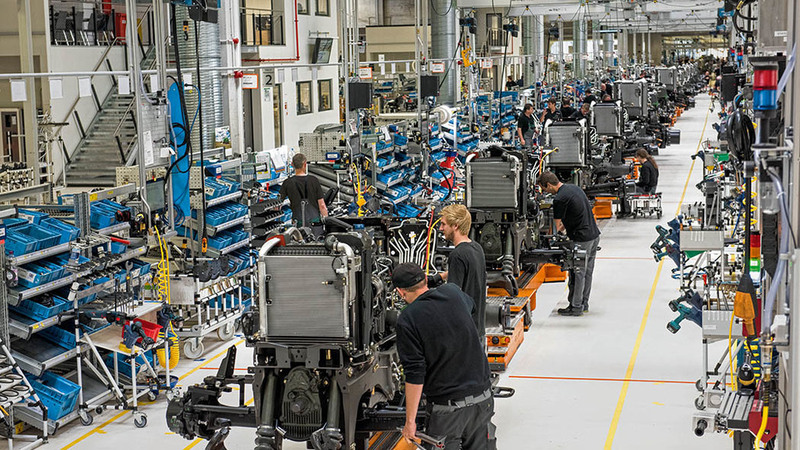 Viewed by many to be the Rolls Royce of tractors, we go behind the scenes of Fendt’s Marktoberdorf tractor factory, Germany, to see what goes into the production of these highly revered machines. Nestled in the picturesque surroundings of the Allgau region in southern Bavaria, it is hard to imagine how a small tractor manufacturer on the edge of the Alps became a major global player. But this it did and the Fendt brand is now represented in more than 35 countries, with recent launches undertaken in South Africa. This footprint is set to grow with the expansion of its portfolio which now includes a full range of grassland and forage equipment, an extensive combine range with an all new flagship model, and a line-up of trailed and self-propelled sprayers. It also has designs on the future, evident by its latest in-field robotics project. Undoubtedly putting Fendt on the map was the development of its Vario continuously variable transmission (CVT). While not the first or the only manufacturer to offer a CVT, it was Fendt’s bold decision to only use CVTs, rather than a conventional gearbox which made the concept as widely accepted as it is. So much so, that like Hoover, many people now refer to any CVT as a Vario. And in 2016, the firm hit a major milestone with the production of its 250,000th Vario transmission. Rightly or wrongly, the firm’s tractors have gained an enviable reputation, owed much in part to the tractor’s perceived build quality and technological prowess – not to mention high residual values. So what goes into making these tractors what they are? To find out, we gained unprecedented access to its Marktoberdorf tractor factory. Apart from its latest tracked tractors, produced in Jackson, USA, all Fendt wheeled tractors are made in Marktoberdorf, everything from the 72hp to 101hp 200 Series, up to the 396hp to 517hp 1000 Series. In 2013, the factory churned out a peak of 17,000 units, producing 100 tractors per day in two shifts. Since then, the market as a whole has dropped back, with 13,667 tractors sold in 2016, of which 64 per cent were exported. Currently, there are about 80 tractors per day being produced in a single shift. Each tractor takes about 10 hours to assemble. The ambition is to get the plant up to its full production capacity of 20,000 units by 2020. Depending on model, each tractor comprises about 10,000 to 11,000 components in total. But despite the requirement of so many components to produce thousands of tractors, there is very little storage at the factory. Instead it employs a just in time, lean strategy, something which many factories carry out to improve flows of material, people, work and information, and eliminate waste. Each tractor is built to order – there are limited numbers of stock tractors built, often for fast replacement. WHAT GOES INTO A FENDT TRACTOR? At the heart of each Fendt tractor, is the firm’s Vario continuously variable transmission. 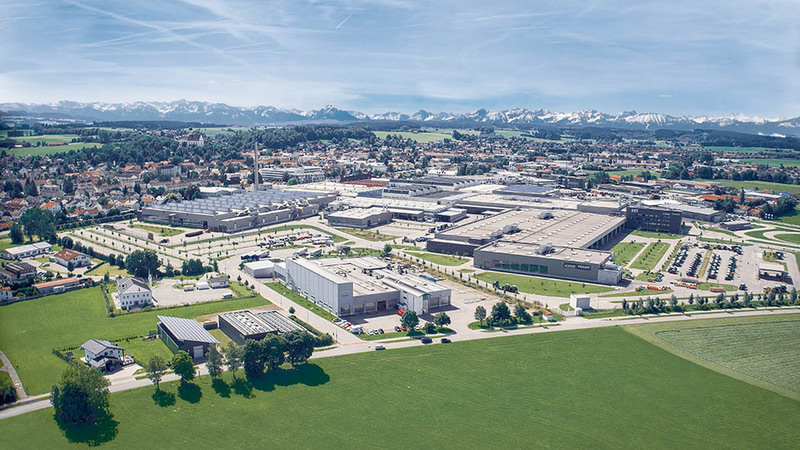 At Marktoberdorf, two machining halls are dedicated to producing this and the final drives, of which Fendt produces about 85 per cent of the components involved. All raw materials and castings are bought-in, coming from about 20 different Europe-wide suppliers, many of which are long-term partnerships. To maintain accuracy during machining, the temperature inside the halls is kept to a constant 23degC, with components coming into the factory held in a separate room until their temperature acclimatises to the factory. This prevents any unexpected expansions or contractions of the metal during the machining process, which can result in up to 1.5mm of difference on large components – a massive amount in precision engineering terms. From components being fabricated and machined, there is only about a three-hour window before the powertrain is assembled. In between this, transmission casings are wrapped in plastic to prevent any dirt or dust settling on the precisely machined components. To check component dimensions, a ‘disconnected’ quality control room is used. Although it looks part of the machining hall, springs underneath the room isolate it from any unwanted vibrations. Seismic sensors also monitor geological movement, and should vibrations get too high, measuring of components stops until at a satisfactory level. 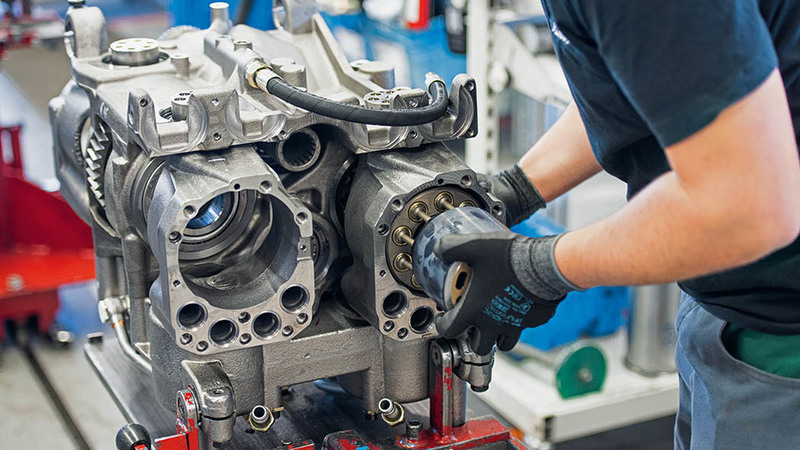 Following assembly, every single powertrain is pressurised to a massive 530 bar, to test for leaks – normal operating pressure of the powertrain is between 250- and 350-bar. Total site size of the Marktoberdorf site is 35 hectares (86 acres), with 100,000sq.m under cover. All tractor models are assembled on a single line. For maximum logistic efficiency, all parts arrive at the line just in time. Tractors are automatically carried on carts down the line, which follow metal strips in the ground. The assembly line is made up of more than 30 stations. Each station has, on average, about six minutes to assemble its respective components. To maintain the average assemble time, small tractors precede and follow larger tractors down the line, which looks very comical when a 1000 Series has a little 200 Series either side of it. All parts used and assembled are confirmed via computer screens at each station, which also signals the parts department that it is ready for the next lot of components. With cabs and bodywork coming from its Baumenheim facility, painting at Marktoberdorf is confined to the chassis and powertrain, with 80 per cent of painting done automatically. It takes three hours and 20 minutes for a tractor to travel through the multi-stage paint shop. All water from the paint shop is recycled, as is 60,000cu.m of air every hour. Due to its organic properties, any undercoat paint collected is recycled and used in pet food. Any top coat paint collected is recycled for domestic paint use. Cabs arrive at the line in sequence, to match the tractors being assembled. Again, the just in time method only allows for a three- to four-hour window from when the cabs arrive at the factory, to being fitted to a tractor. Cabs also arrive completely finished from the Baumenheim factory – bolt on, plug in, done. At the end of the line, all fluids are added and the tractors started up. Wheels are then fitted and it is off to a power and brake test. 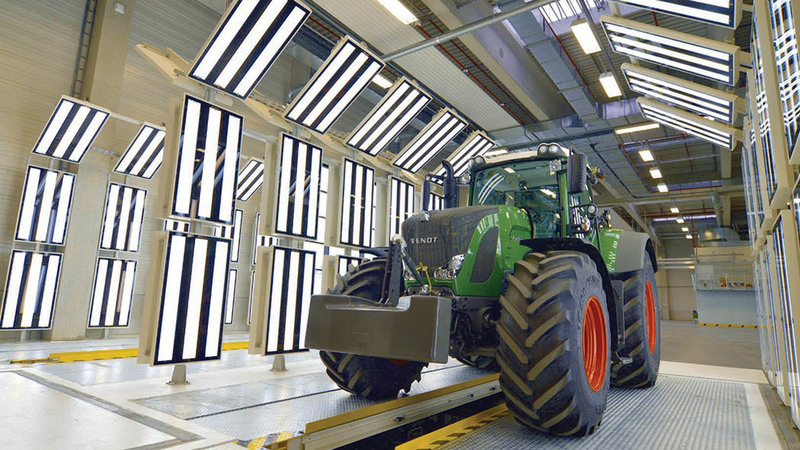 Finally, tractors pass through a light tunnel, a method used by top car manufacturers, to check for any imperfections.